Wushu (a.k.a. kung-fu 功夫) translates literally as "military art" , which is to say it is technically about how to win wars, and usually is presented in the context of hand-to-hand combat. 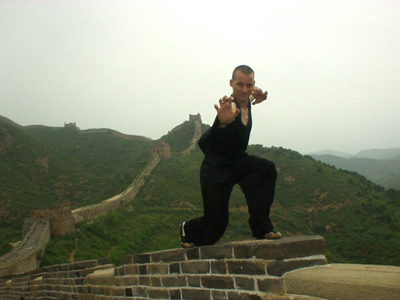 The stereotype of "kung-fu", even in China, is of flying fists and dizzying combinations of kicks, eye-pokes, and the like. But, in fact, wushu really is not about fighting per se : if you stop to think about it, the best way to win a war or a fight is for your opponent to completely surrender without any fighting at all! It goes much deeper than that, of course. 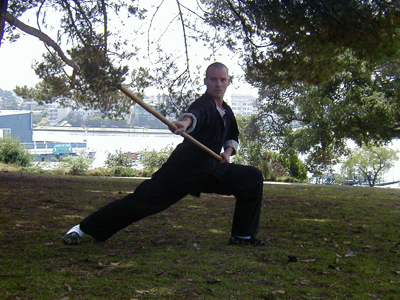 From a physicist's perspective, I can say that wushu has several levels of sophistication that express themselves in different environments, similar to how the relevant physics of a situation is either classical (Newton's Laws), statistical (large ensembles of particles) or quantum (at small distances). 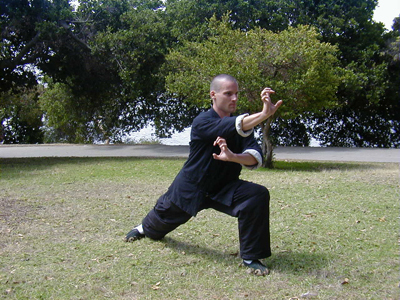 Going along with this analogy, the most basic wushu stuff that you learn as an amateur such as punching, kicking, flipping through the air and spinning on the ground, these are all "classical" techniques which can all be described with Newton's Laws and understood to be force-maximizing, effort-minimizing ways to move and attack. 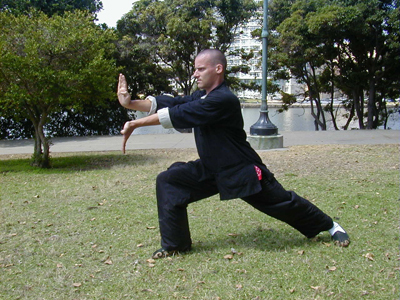 A wushu punch, for example, emphasizes twisting of the waist in addition to propelling forward one's fist, which increases the path length along which one exerts force and hence maximizes work delivered to a target. Actual combat involves a more "quantum" approach, reserving the potential of executing a number of different combinations of techniques, since you do not have perfect knowledge of what your opponent will try. 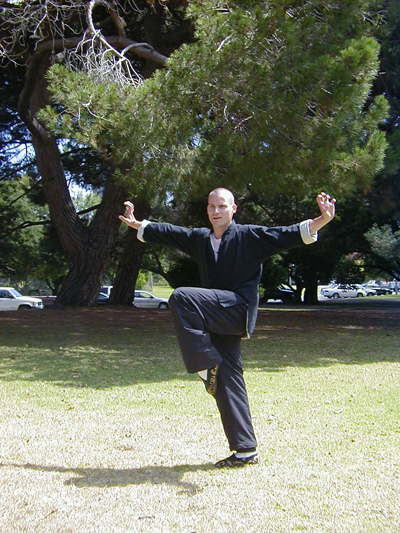 The extreme expression of this "quantum" behaviour is Tai Ji ("tai-chi"), where one's actions seem soft and slow but in fact are loaded with potential to snap into action at any instant. Ideally, the tai ji master should be ready for any possible affront, yielding in-step with the opponent's advance just to the point where he becomes overextended, at which point his loss of balance can be exploited in countless ways with little effort. Tai Ji is inherent in all aspects of life, from catching a heavy object (moving `with' the object makes the catch easier) to conducting a business deal (moving with market trends and clients' interests so as to be profitable to all parties) to combating illness with rest and holistic treatments (this is what Traditional Chinese Medicine is all about). 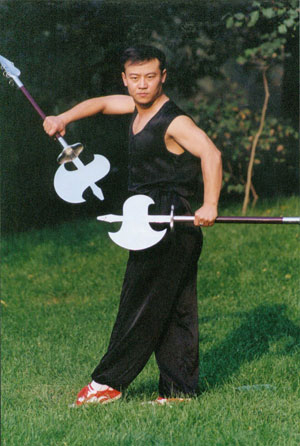 In China, I studied for four years with former Beijing Wushu Team member Yi Shi-Xiong (e.g. here' s one of his performances), concentrating on Southern Fist, Staff, and Broadsword. 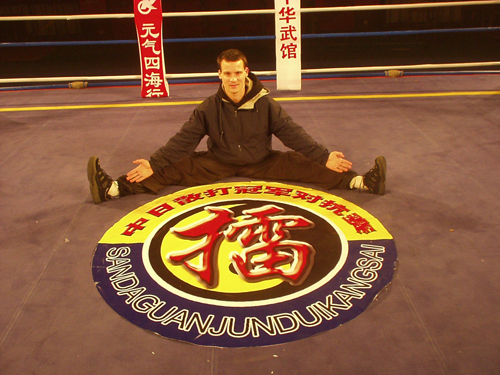 In Chengdu, I trained with a Chengdu Sports University coach Zeng Yi in Tai-Ji. 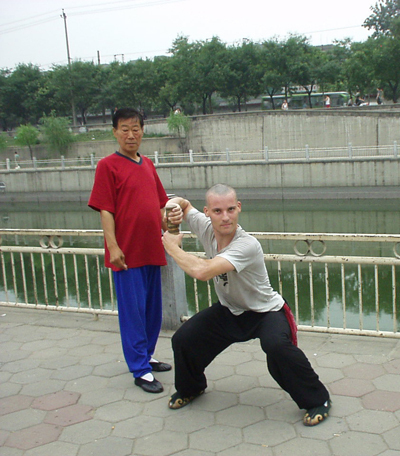 Wushu, like physics, can be learned through fighting (experiment) or self-practice (theory), but in any case it is important to have teachers to guide you along the way. 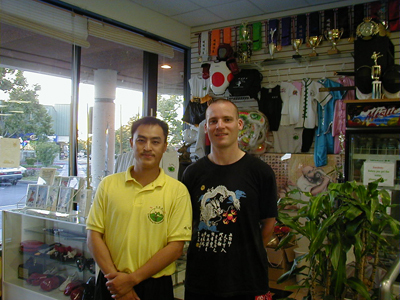 Tony Chen, head of the Omei Kungfu Academy in San Leandro, counts as my first teacher. Yi Shi-Xiong is my main teacher. Yi Shi-Xiong's father, Yi Yong-Chang, was regarded as a great old-school master. 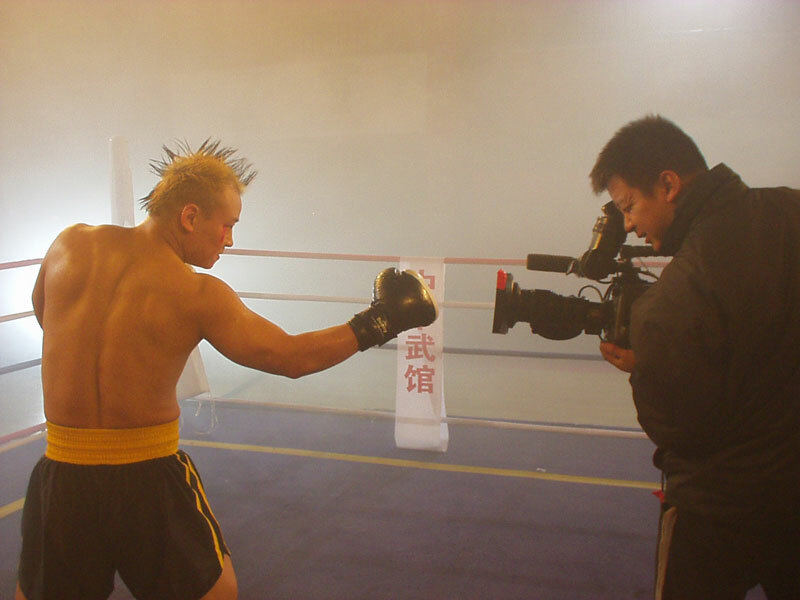 One of the highlights of my wushu experience in China was getting to act with my master Yi Shi-Xiong in a TV series, "King of Chinese Kungfu" (see video cover below: I'm at left while Yi Shi-Xiong has the blonde mohawk at right). Although I wasn't quite the leading role, I still made some good appearances and had a lot of fun in the process. You can watch the whole series online for free at this Chinese website! (my lengthier appearances are in episodes 1,2 and 11, which you can choose from the menu frame on the right after clicking on the big blue 'play' -- 播放正片-- button). Two things about acting and filming made a big impression on me. First, (almost) everything is fake. Aside from makeovers, hairpieces, and lighting, I mean "sweat" is really water sprayed from a bottle (believe me that's cold in the winter of Northern China! ), "blood" from a punch is actually a sweet-tasting berry you crunch in the mouth at the right instant, and anyways the punches and kicks don't really land: wires and cables pull you to simulate a big impact (see photo at far right below), etc., which to anyone with a physics background looks phony ... surprisingly, the vast majority of viewers don't pick up on it, and some actually believe kung-fu fighters can instantly "fly" over buildings, delivering kicks in-flight without receiving the recoil to conserve momentum (in reality, of course, the well-hidden cable is absorbing the shock). Secondly, nothing really happens in the order you see it. The first scenes of a movie may very well be the last ones shot in the production -- little tip-offs like a character's fullness of beard, arrangement of objects in the background --- these things change on the timescale of the shooting (weeks or months) and if you pay close attention you'll notice it, sometimes painfully so, like when in the "instant" between one character's question and another's reply, the camera flipping back and forth in close-up shots, the clock in the background has "magically" advanced twenty minutes! It is interesting, however, that a movie made up of lots of separate sceen shots looks and feels better than one with a continuous camera scan, like an amateur home video (a little more discussion on this phenomenon here).